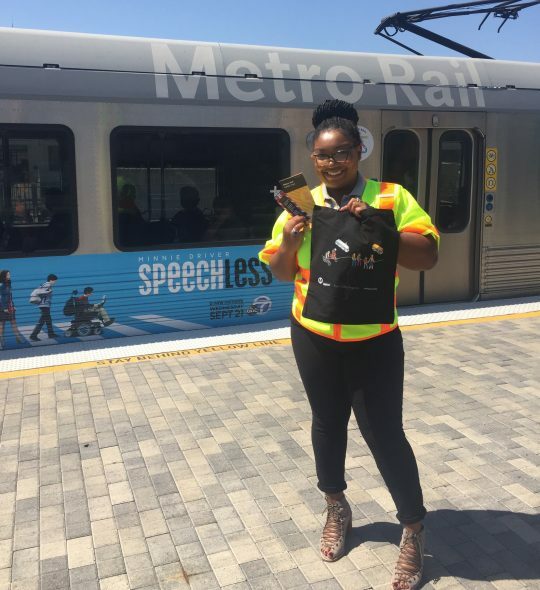 September is the official Rail Safety Month and Metro’s transit safety team will be out and about the entire month handing out goodies and reminding riders to look, listen and stay alive when around trains. Remember: safety begins with you. Tuesday, Sept. 6, at Union Station East Portal, 7 to 10 a.m.
Monday, Sept. 12, at Willowbrook/Rosa Parks Station, 7 to 9 a.m.
Wednesday, Sept. 14, at La Cienega/Jefferson Station, 7 to 9 a.m.
Friday, Sept. 16, at Azusa Downtown Station, 7 to 9 a.m.
Wednesday, Sept. 21, at Downtown Long Beach Station, 11 a.m. to 1 p.m.
Thursday, Sept. 22, at Sierra Madre Villa Station, 11 a.m. to 1 p.m.
Friday, Sept. 23, at Downtown Santa Monica Station, 11 a.m. to 1 p.m.
Wednesday, Sept. 28, at Culver City Station, 4 to 6 p.m.
Thursday, Sept. 29, at Atlantic Station, 4 to 6 p.m.
Friday, Sept. 30, at Compton Station, 4 to 6 p.m. I am surprised (or should I be?) there is no out reach at the areas where Metro does a lot of street-running near the stations used by those who must actually “dodge the trolley” (from whence the baseball team go its name). Yes, you will have pop-ups at DT Long Beach and DT Santa Monica, but the audience that needs to be reached are at stations like Pacific Coast Highway in Long Beach, 17th Street in Santa Monica, or Highland Park in NELA. And really, it isn’t only the stations that need the “pop-up”. It is the intersections where pedestrians and bicycle-users cross the path of Light Rail, especially those who do not ride the train and may think it can stop like a bus or other rubber-tired vehicle. Like the guy who dashed in front of my northbound Blue Line train at 3rd and Pacific in Long Beach last night just as the train got the green light. You won’t reach him with a “pop-up” at the Transit Mall station. Another factor ‘pops out’ – why no weekend events? IMO late afternoons should be better attended as folks are not rushing to work. I agree that more attention should be paid other problematic areas like the ‘inner’ Expo and Blue Line crossings and the famous Farmdale (Dorsey HS) stop. I went to the one at willowbrook station and there was nothing. I was there at 7:40 and nobody (except passengers) were there. Why get people’s hopes up for nothing?